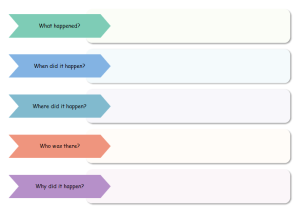 Creating five Ws chart with free templates and examples. Five Ws chart has never been easier. Five W's charts answer the following five questions: what happened, who was there, why did it happen, when did it happen and where did it happen. The five W's chart helps students identify the main idea and the related supporting ideas of a lesson, text, or a concept by creating a framework to sort the information. 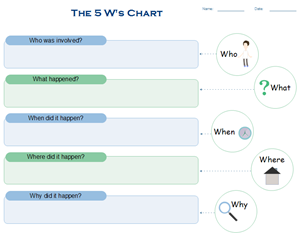 Five W's charts are useful for examining the key points of a story or event. With Edraw, you can easily and quickly draw a professional-look Five Ws Chart diagram to help with problem solving, decision making, studying, planning research and brainstorming. It offers plenty of examples for you to view, and abundant shapes for you to use. The intuitive interface and easy-to-use tools allow both experienced users and novices to design smoothly and effectively. You can just focus on the content, not the drawing. All the diagram you created could be printed or export to PDF and other graphic formats. A simple five Ws chart template is ready to use in vector format for your own designs. Use this 5 W's chart example to help students with reading. Fill in each row with details that answer the question. 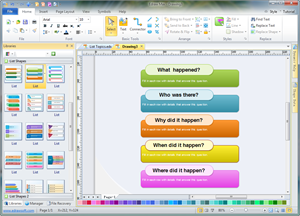 Create more W's chart templates with an easy Five Ws chart maker.